Classes begin with a half day on a Tuesday in late August, and graduation is the last Friday in May or the first Friday in June. • ECC Afternoon Enrichment (Optional) 12:00–3:15 p.m.
Our campus is where it all happens: learning, working, and playing, and sharing in traditions such as Fall Festival, Shakespeare plays, Spring Teas and Buddy Family picnics. We invite you to come for a visit to our wonderful, and beautiful, school. 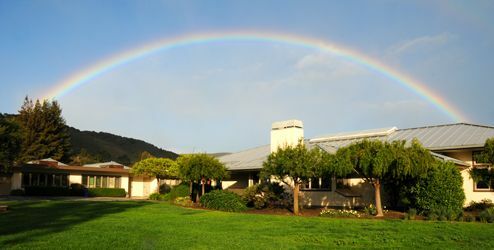 The lovely campus of All Saints’ Day School is set on 17 acres in a valley surrounded by mountains and natural beauty. It is often the inspirational backdrop for students’ art, writing, and science projects as well as hours of play on the fields and play structures. The original school building and administrative wing were completely renovated in 1999 and a new playground was built in 2007. The construction of the new Morgan Family Early Childhood Building and renovation of Coats' Hall multi-purpose gymnasium and Bardis Performing Arts Center were completed in 2011, providing new and exciting opportunities for our educational program! Further improvements include the Morgan Family Tech Center, new outdoor basketball courts, and expansion of the school's Organic Garden with a Forno Bravo pizza oven. 2018 brought the Chrissi Morgan Learning Commons in the Castle Library. A unique learning center for students to study, cooperate, explore, and invent. The dedicated Preschool Building probably has the best view on campus. Overlooking the fields and the mountains, the building features a generous space for play and learning, kitchen, bathrooms, and office space, and a large outdoor play area.